Violent clashes broke out Friday afternoon between left-wing activists and police forces in the east Jerusalem neighborhood of Sheikh Jarrah. About 30 protestors were arrested and one demonstrator was lightly injured. She was evacuated to the Hadassah Mount Scopus Hospital in the capital, suffering from bruises. Some 350 left-wing activists arrived in the neighborhood for the weekly rally. They chanted, "Fascism won't come" and "you won't succeed in killing a popular resistance." At one point, about 100 protestors settled on the road leading to the Simeon the Just compound, which was recently inhabited by four Jewish families armed with a court order following the evacuation of Arab residents. The police declared the protest an illegal gathering and ordered the protestors sitting on the road to evacuate themselves within three minutes. The activists refused to leave and were forcibly evacuated from the area. About 30 of the protestors were arrested. Israel Radio reporter Shai Zilber, who was covering the event, was also detained. He suffered several blows and was released by the police after they discovered he was a journalist. One of the protestors, Knesset Member Dov Khenin (Hadash), said that "the police are using excessive violence both against demonstrators and against journalists. A large group sat on the ground without bothering anyone or acting violently, and the police used a lot of force. "Hundreds of people arrived to protest against the injustice taking place in Sheikh Jarrah, as well as to demonstrate for peace," he added. "A Jewish settlement in the heart of an Arab neighborhood means preventing a future agreement as part of a two state for two people solution. We are fighting now just for peace, but for democracy in this society." Former Hebrew University President Hanoch Gutfreund, who took part in the rally, said: "I am a Jerusalemite and I love the city. Many of my friends have left, and I am not thinking about leaving, so it's very important for me to see all of Jerusalem's residents treated fairly. "The residents of Sheikh have been living in their houses since the 1950s, and they are subject to injustice. This is the only reason I am here, not for any political reason, to express my solidarity with them and my opinion about what is being done to them." 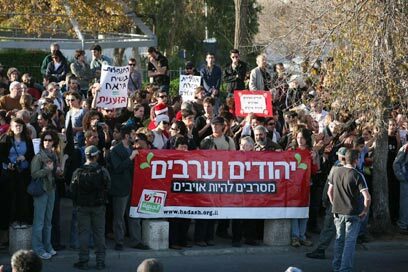 Avnet Inbar, one of the rally's organizers, said: "Today we came to protest in the exact same place where the police allowed hundreds of settlers to protest on Jerusalem Day. We sat on the road in loyalty to the non-violent popular disobedience tradition, which every conscientious civilian turns to when the law is misused by the enforcement authorities for discrimination and theft purposes." Meanwhile Friday, left-wing and Palestinian activists held their weekly Friday rallies in the West Bank. A left-wing activist was lightly injured from a stone hurled by Palestinian protestors in the village of Nabi Salih. She was evacuated to a hospital in Jerusalem. one protestor was arrested. Some 100 people took part in the demonstration. About 80 people demonstrated near the village of Bilin in protest of the separation fence being built in the area. They hurled stones at Israel Defense Forces soldiers, who responded with shock grenades and tear gas. A similar rally was held in Naalin with 50 participants. See all talkbacks "30 protestors arrested in Sheikh Jarrah"